If you discover that there is mold in your house, then you may be wondering what the best methods are to rid your home of mold. You may be able to get rid of the mold in your house with DIY removal methods if you detect mold spores early. However, if you overlooked signs of mold for a significant period, then you may need to seek professional help. Regardless of the method you choose, the mold growing in your house must be removed quickly. If you choose the DIY removal route, then you will need to know which products are safe to use around the house to eliminate the mold. You will also need to know which items you can clean in the washing machine and which pieces must soak in the sun. Therefore, you will need to know the following tips for getting rid of mold in your home. Before you can rid your home of the mold with DIY methods, you must know which household products kill mold. Products that you can find around the house that kills mold include chlorine bleach, distilled white vinegar and hydrogen peroxide. While you may have many of these products in your home, you may want to consider buying new bottles. If these products were stored in areas infested with mold, then you would risk contamination. Now that you know which products can kill mold let’s take a look at some tips for getting rid of mold. Since bathrooms are often damp, humid and retain moisture, they are breeding grounds for mold. Although you can buy commercial mold remover cleaners in stores, they are often expensive. To save money, you can make your own solution, which is just as effective and a fraction of the cost. By mixing one cup bleach to one gallon of water, you create a DIY mold-remover cleaner for your bathroom. Once you combine the two products, add the solution to a spray bottle and wear eye protection and rubber gloves before you spray the moldy areas in the bathroom. With the solution, you can spray regions exposed to mold, like tiles, shower doors and shower curtains. Let sit for 15 minutes then scrub the mold away with a stiff brush. Since the kitchen is known to hold household appliances that combine moisture and heat, which can grow mold, you must do a thorough clean of these appliances. With your newly purchased distilled white vinegar, you can wipe down appliances like the refrigerator, microwave, coffee maker and washing machine. With your bleach and water solution, you can also clean the tile and grout. The last appliance you should clean is the washing machine since clothes exposed to mold have a moldy and musty smell. If there are signs of mold in the machine, then you can run a load on a hot water cycle with chlorine bleach. Doing so at least once a month will help prevent mold growth. If your walls are painted or wallpapered and there are signs that mold is growing, then take your bleach and water solution and spray the exposed area. Be sure to wear protective gloves an apply with a soft scrub brush. After the solution soaks for 15 minutes, rinse it off with water. Let the solution dry thoroughly, either with a fan or by opening a nearby window. To remove mold from wood paneling or drywall, take your bleach and create a new solution with water and detergent. Doing so will better help the solution stick to the surface. Then, apply with either a mop or sponge in even layers and do not rinse off. Let the solution air dry with a fan or an open window. If there is mold growing on your carpet, then you are going to need to rip it out entirely. When doing so, be sure to wear protective gear. When you dispose of the moldy carpet, you will need to wrap it in heavy plastic. To prevent the spread of airborne mold spores, you must clean the floor under the carpet thoroughly. Once the areas are cleaned, allow it to air dry for several days. Then, you can replace the flooring. First, begin by gathering all the moldy fabrics and place them outside to prevent the spread of mold spores. Then, brush off the spores with a stiff brush and allow each item to soak in the sun for at least three hours. If blankets and clothes are dry clean only, then take them right away to a professional cleaner for proper cleaning. Next, take the fabrics that can be machined washed, such as curtains, plastic shower liners, sheets, towels and clothes, and throw them in the washing machine. Finally, run the machine on the hottest water cycle recommended for each item. Be sure to add a disinfectant. For white loads, you can wash them with chlorine bleach. You can also soak colored fabrics in liquid non-chlorine bleach for 30 minutes. If after the wash the mold stains remain, then create a cleaning solution of oxygen bleach and water and soak the items for at least eight hours. 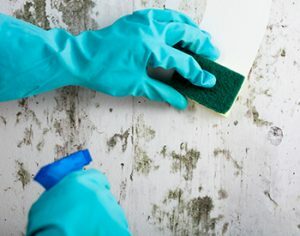 When you remove mold from your home, you may do a thorough job of cleaning your walls, ceilings and floors but neglect your everyday household items. For things like books, paper and magazines, remove them and allow them to air dry in the sun for at least three hours. After they dry, you can brush off the mold with a dry rag. If there are stains, then you can wipe them away with a soft cloth dipped in a solution of one-part chlorine to four parts water. Then, fan-dry or pat pages dry. For moldy, leather items, such as shoes, bags and furniture, first, remove the items from your house. Next, wipe down each piece with a cloth dipped in distilled white vinegar. Then, wipe them down with warm water and leather soap. To dry, use a soft fabric then allow each item to air-dry completely. Finally, once dry, add a leather conditioner to each.